An extraordinary live performer and prolific songwriter with eighteen studio albums under his belt, Bruce Springsteen has been a consummate rock’n’roller and a veritable force of nature on the contemporary music scene for over forty years. “The Boss” (a nickname that grew out of the collection and distribution of nightly pay for gigs in the early days) shows no signs of slowing down or resting on past achievements. Springsteen and the E Street Band (backing him since 1972) routinely do concerts lasting well over three hours despite most of them having to deal with the realities of advancing age. “The Boss” seemingly has untapped reservoirs of energy and the E Streeters follow right along consistently turning in great shows night after night. Born in Long Branch, New Jersey in 1949, Springsteen became transfixed with rock’n’roll music at an early age and concentrated on following in the path of his hero and idol Bob Dylan pretty much to the exclusion of everything else. In 1988, he famously told the story of what happened upon hearing “Like a Rolling Stone” for the first time. According to him, the song blared out of a car radio while riding around with his mother in the summer of 1965. That snare shot that sounded like somebody’d kicked open the door to your mind. It reached down and touched what little worldliness a 15-year-old high school kid in New Jersey had in him at the time. Dylan was a revolutionary. Bob freed the mind the way Elvis freed the body. The album that helped Springsteen achieve mainstream popularity to the point where he essentially got identified as the face of rock’n’roll, Born to Run was released in 1975 after more than a year of tedious and often contentious behind the scenes disputes, soul searching, and career defining decisions. The fanfare and promotional publicity surrounding the LP caused “The Boss” to get tagged as the “new Dylan” and to become recognized as “rock’n’roll’s future,” a quote from journalist Jon Landau (who eventually took over as his manager in the 1970s). Not surprisingly, he rebelled against such heavy-handed typecasting. Still, the hype probably helped Springsteen make the cover of Time and Newsweek in the same week—October 27, 1975. During the 1990s, almost exactly coinciding with the time Bill Clinton served as President, Springsteen pursued a solo career. Having broken apart the legendary E Street Band in 1989, he released Human Touch, Lucky Town, and The Ghost of Tom Joad in quick succession. The last of the lot came out in 1995 and won a Grammy for Best Contemporary Folk Album. The title cut (based on a character from John Steinbeck’s The Grapes of Wrath) contained some of Springsteen’s most biting and politically astute lyrics. 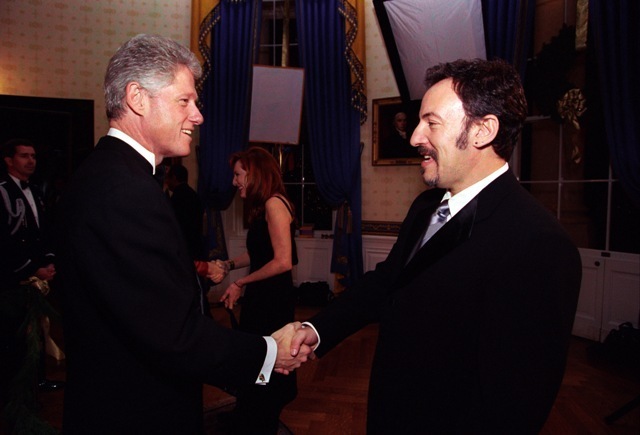 The photo of Bruce Springsteen and President Clinton is taken from the Kennedy Center Honors Reception in the East Room of the White House on December 7, 1997. The honorees for the main event to be held later that evening were Bob Dylan, Lauren Bacall, Charlton Heston, singer Jessye Norman, and dancer Edward Villela. 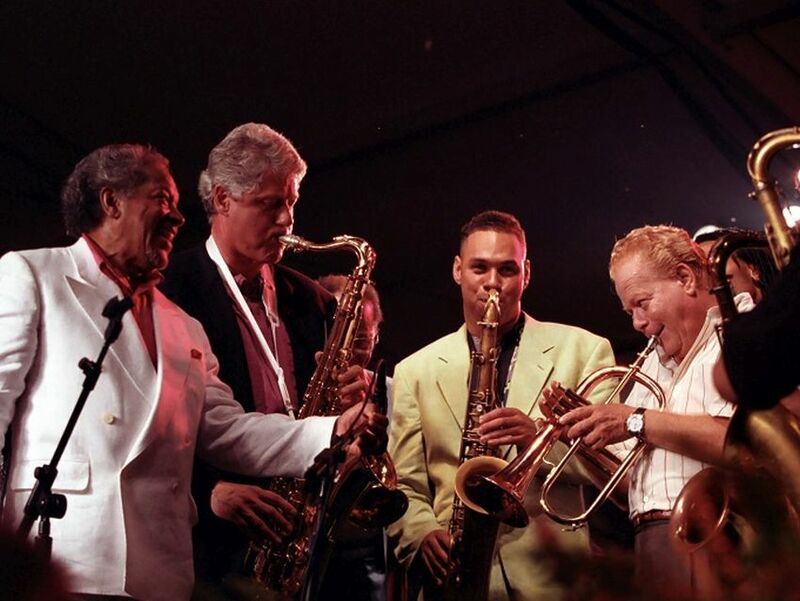 Attendees at this preliminary gathering included Hillary Clinton, Patti Scialfa, Sidney Poitier, Wynton Marsalis, Jr., Dina Merrill, Richard Holbrooke, and Senator and Mrs. Dale Bumpers from Arkansas. Springsteen was scheduled to do a performance in support of Dylan, who he viewed with admiration and awe since his youth. Dylan predictably wound up as the last individual honored in the three hour show, to be broadcast later in the month by CBS. “The Boss” walked onstage with a guitar and harmonica rack and opted (even more predictably) to perform “The Times They Are A-Changin.’” Springsteen’s version of one of Dylan’s most revered anthems received a nice round of applause from the audience. In the 21st century Springsteen produced a pivotal album centered around the events of September 11, 2001, campaigned on behalf of the Democratic Party and its presidential candidate and, most recently, made the social scene at a special sneak preview of a highly touted Hollywood movie. On July 30, 2002 he put out The Rising, his first LP with the recently reunited E Street Band since the highly acclaimed and runaway commercially successful Born in the U.S.A. 18 years ago. In it Springsteen delivered a series of heartfelt and memorable songs dealing with the terrorist attacks that brought down the Twin Towers in New York City. Out of the gate the record established itself as a critical and fan favorite. Springsteen, who had for a long time generally steered clear of making anything even resembling a political endorsement, hit the campaign trail in support of Barack Obama both in 2008 and 2012. At each appearance he would give a brief statement saying why the Democratic nominee stood as the best choice for the American people. Then a few songs (usually four or five in number) followed. Bill Clinton joined with “The Boss” at the last presidential election and helped the incumbent emerge victorious over his Republican opponent, Mitt Romney. In August of 2015 Springsteen showed up at a special sneak preview of Bill Murray’s new movie Rock the Kasbah. The real buzz surrounded the afterwards party at the Blue Parrot Bar and Grill located in East Hampton, New York. On vacation in the Hamptons, Bill Clinton, Springsteen with his wife Patti Scialfa, Paul McCartney, Jon Bon Jovi, John Mellencamp, Rudy Giulani, and Roger Waters (of Pink Floyd) joined the cast of the film (Murray, Bruce Willis, and Kate Hudson) to celebrate its grand opening. As might be expected, Clinton became the center of attention. According to Variety, he received numerous selfie requests from the partygoers. Even Springsteen and the other musicians and actors seemed to be in awe of the former President.